''Wise old man, won't you help me, please? My house is a squash and squeeze.'' A little old lady lives all by herself in her house but she's not happy - it's just too small, even for one. Whatever can she do? The wise old man knows: bring in a flappy, scratchy, greedy, noisy c... read full description below. Wise old man, won't you help me, please? My house is a squash and squeeze. A little old lady lives all by herself in her house but she's not happy - it's just too small, even for one. Whatever can she do? The wise old man knows: bring in a flappy, scratchy, greedy, noisy crowd of farmyard animals. When she pushes them all out again, she'll be amazed at how big her house feels! 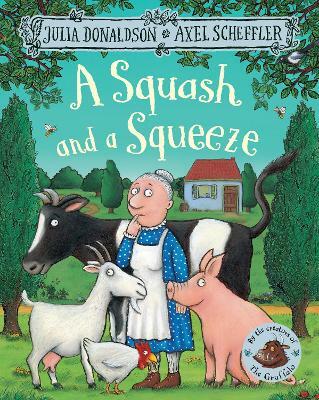 The brilliantly funny A Squash and a Squeeze was the first ever picture book written and illustrated by the unparalleled picture-book partnership of Julia Donaldson and Axel Scheffler, creators of The Gruffalo. This edition features the classic story with a stunning, redesigned cover and beautiful finish, making it a must-have addition to the bookshelves of all Donaldson and Scheffler fans - big and small! Also available with redesigned covers are The Gruffalo, The Gruffalo's Child, Room on the Broom, The Snail and the Whale, The Smartest Giant in Town, Monkey Puzzle and Charlie Cook's Favourite Book.